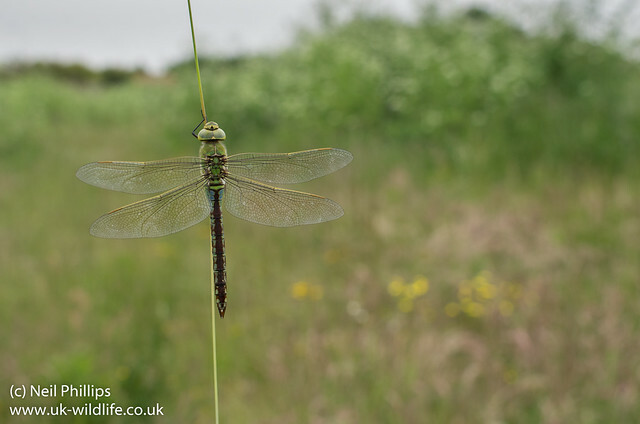 Its our largest dragonfly growing to 78mm in length and with a wingspan of 106mm, though some argued the female golden ringed is larger with a maximum length of 84mm, but a wingspan of 101mm (Smallshire and Swash, 2004), it is more slender than the emperor. 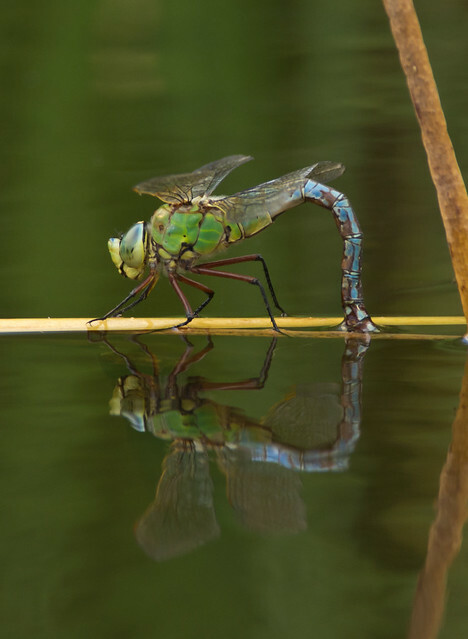 The males are an impressive sight to behold as the patrol an area of lake margin or a pond, fighting with other males and other dragonfly species and chasing prey, small items which they often eat on the wing. They have even been known to eat other dragonflies! 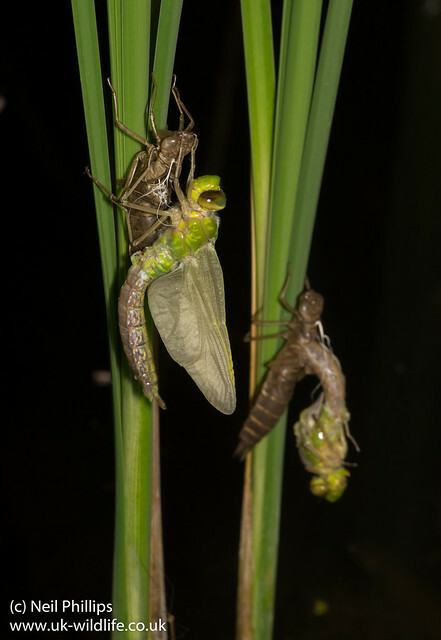 Their life cycle starts (if you can a cycle starts) in ponds, where the female lays eggs by inserting them into pond weed, which then hatch after 3 weeks (Smallshire and Swash, 2004). 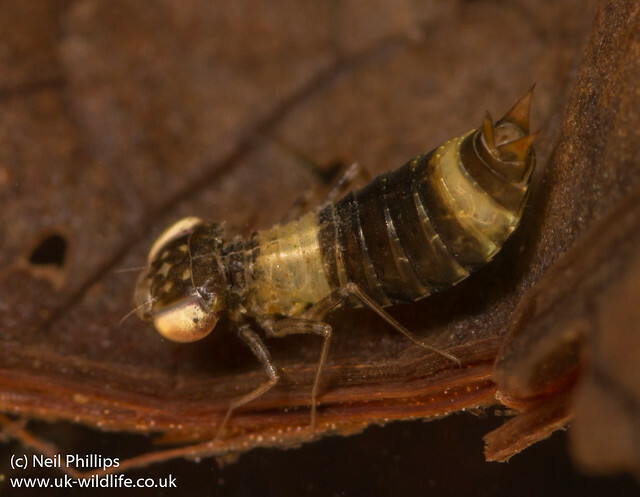 The larva or nymph live in the vegetation in the ponds hunting other pond creatures including tadpoles and mayfly larva. I have noticed that the smaller instars (stages of the larva form) seem to often be striped in this species. They grow over 1 or 2 years and at full size they are the biggest dragonfly nymphs (only the rare vagrant/occasional breeder, the lesser emperor matches its size), which can grow to 56mm long (Cham, 2006), big enough to take small fish! Once fully grown they emerge, from mid May onwards, crawling out of the pond to become an adult dragonfly. So that is species one, I could say so much more, but it will have to wait for another time. D. Smallshire and A. Swash, 2004, Britain’s Dragonflies, Wild Guides Ltd.